MANSFIELD, Mass. – Holding a four-point lead early in the fourth quarter, the Mansfield football team was in search of a stop that could potentially change the game. The Hornets might not have gotten the stop in terms of yardage, but they got something even better. Going for it on fourth and one from its own 34-yard line, Barnstable quarterback Matt Petercuskie (12/38, 116 yards) lined up under center, snapped the ball and appeared to get enough of a push for a first down. While fighting for extra yards, the QB extended the ball out. Mansfield senior linebacker Philip Dinov alertly punched the ball free and it popped right into the arms of junior Michael DeBolt (eight carries, 48 yards), who took off for a 35-yard fumble return for a touchdown and a 21-10 Hornet advantage with under nine minutes to go. It turned out to be the biggest play of the game and the Hornet defense didn’t break the rest of the way as top-seeded Mansfield earned a 28-10 victory over the fifth-seeded Red Raiders. DeBolt finished with three touchdowns with his two others coming on the ground. The junior missed the first three games after suffering an injury in preseason. He’s played on the defensive side of the ball since Week 4 but didn’t start on offense until the final game of the regular season. While Mansfield extended the lead with the fumble recovery, the Hornets put the game to rest with its next defensive series. Facing another fourth down, this one from its own 41-yard line with six yards to gain, Petercuskie dropped back to pass but Mansfield junior Makhi Baskin read it perfect, jumping the route and picking off the pass. Baskin took the return 40 yard down to the Barnstable 14-yard line. Two straight runs from DeBolt resulted in a score, the second one from 3-yards out and the Hornets suddenly had a 28-10 lead with 5:40 to play. The last 5:40 took 30 minutes to play but the Hornet defense didn’t break at all and kept the Red Raiders out of the end zone despite a pair of trips inside the red zone. Though Mansfield’s defense had a terrific game, it had a slow start as the Red Raiders came out firing. The visitors marched 75 yards on 16 plays, converting a fourth down inside the red zone on a questionable catch call. Barnstable’s hurry up offense and quick screens gave Mansfield some issues, and Petercuskie used a QB option keeper to score from five yards out to make it 7-0 just 5:03 into the game. Mansfield’s offense had an important response right away, scoring on its opening drive to tie the game. After DeBolt had a nice return, the Hornets used their ground game to move the ball. After quarterback Aidan Sacco (14 rushes, 110 yards) had a couple of nice gains, DeBolt punched it in on third down from two yards out to make it 7-7 with 2:05 left in the first quarter. After the opening drive, Mansfield’s defense did a nice job adjusting to the Barnstable offense, which Redding credited to defensive coordinator Mark DeGirolamo. The Raiders’ next two possessions ended in three-and-outs and negative yardage. “Coach DeGirolamo talked to the secondary about how to line up against the quads. We didn’t practice it all week and he did a good adjustment to handle their quick little screen game. We were able to double Conner Baldasaro, took their best receiver out of the game and the key was we covered the other guys one-on-one and did a great job there. Coach DeGirolamo gave them a lot of different coverages, their QB is so smart so we tried to throw a lot of looks at him and we might have thrown him off a little bit. Mansfield’s offense didn’t fair much better as they saw a 33-yard field goal attempt go wide right on their second drive. And on their third drive, facing fourth and 5 from its own 44, the Hornets elected for a fake punt call and came up a half yard short with 1:15 to go in the half. That was just enough time for Barnstable to get down field and Jonathan Silva hit a 25-yard field goal as time expired to give the visitors a 10-7 advantage at half. Similar to its first drive of the first half, Mansfield’s offense had a key opening drive to the second half. The Hornets orchestrated a 10-play, 59 yard drive to take the lead for the first time in the contest. After yet another good return from DeBolt on the kickoff, the Hornets converted a first down n a carry from Vinnie Holmes at midfield, only for an unsportsmanlike penalty to knock them back 15 yards. Although Sacco ran for 11-yards, the Hornets were called for holding on the next play and faced 1st and 20 from their own 39 yard line. Sacco ran for four yards, hit Danny Rapoza for a key 10-yard gain and then jolted seven yards past the marker for a first down. DeBolt followed with a 19-yard run and then Holmes took one up the middle, breaking a tackle and looked like he was about to fall into the end zone for a touchdown. But the ball was poked free and rolled into the end zone. A handful of players jumped on it but it was Holmes that somehow got up and jumped on the ball for a touchdown. With Mansfield leading 14-10, the teams traded punts to finish out the third quarter, setting up the next drive where DeBolt had the fumble return. Now Mansfield football turns its attention to the D2 South Final, where it will host rival King Philip. The third-seeded Warriors took down Natick, 17-7, to advance to its third straight sectional final. The teams met back in September at Alumni Field with Mansfield prevailing, 28-27, after KP’s two-point conversion attempt in the final minute came up empty. 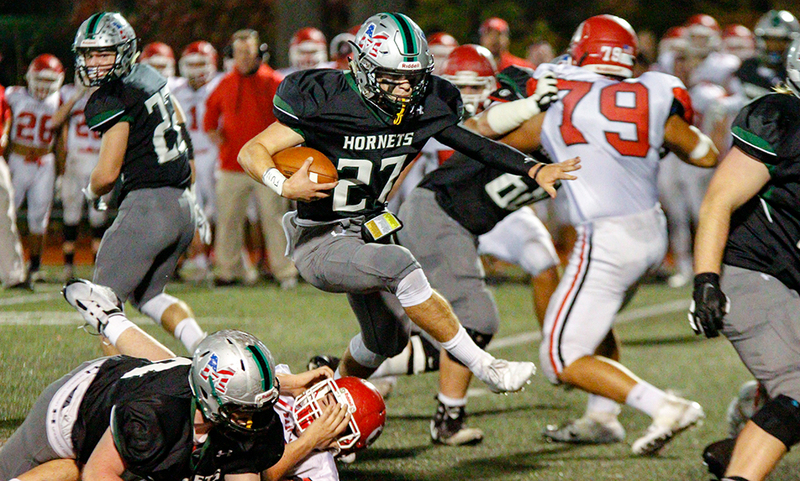 The D2 South Final between the Hornets and Warriors is scheduled for a 7:00PM kickoff at Alumni Field on Friday.